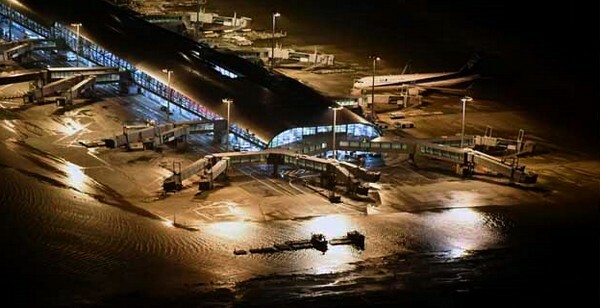 The flooding of Kansai International Airport - once hailed as an incredible engineering feat when its first runway opened in 1994 - reminds us that even the best engineering gem is vulnerable to the power of nature. What happened to the travel hub in southwestern Japan should serve as wake-up call for Hong Kong since its airport is also built on an artificial island. It's vital for SAR government departments and the Airport Authority to review whether Hong Kong International Airport is able to withstand extreme weather conditions, so that what happened at Kansai airport won't recur in Chek Lap Kok. According to a Japanese government spokesman, Kansai airport will reopen for domestic flights from today, while it's not yet known when international flights will resume. In view of the damage caused to the only bridge connecting the airport to the Japanese mainland, travelers should be forgiven for meeting the announcement with skepticism. The hub airport for Osaka has two runways, each with a terminal building. When Typhoon Jebi hit, it was mainly the older Runway A deluged by the storm surge -- the second time in as many years. Since its opening, Runway A has been plagued by problems of sinking due to weak foundation, leaving the runway only one to two meters above sea level. At the height of Jebi's direct onslaught, the runway was about 50 centimeters under water. Runway B was completed in 2007, and is at least 4.6 meters above sea level. It reportedly experienced no major flooding so far. Three years earlier, before Runway B was built, the airport was also washed out in a storm surge. Following that, its sea walls were raised to about five meters above sea level, and engineers were confident at that time the reinforced engineering works could withstand the strongest surges in local history, and the biggest waves expected once every 50 years. Typhoon Jebi gave engineers more than a red face for the failure of their most advanced technology. Hong Kong's airport opened in 1998 - also ballyhooed as an engineering marvel. Fortunately, it has had no serious sinkage issues, like that of its Kansai counterpart. However, the deluge and cut-off of Kansai airport from the mainland show it can be of concern here, as Chek Lap Kok airport is similarly built on an reclaimed island, and connected to Kowloon by only one road-rail link. In 2015, that only link had to be closed for more than two hours after a barge struck the Kap Shui Mun Bridge that forms part of the link. Land traffic to and from the airport had to be suspended while repairs were made. Although Chek Lap Kok airport doesn't have the sinkage issue, Hong Kong's sea level has been rising by an average of 30 mm a decade. As global temperatures climb, weather conditions will only become more extreme. Planning standards deemed to be sufficient can become outdated sooner than predicted. Policymakers must prepare the city for extreme weather conditions.